Same as previous photo, except for Jack Adams standing on left. Man on right may be boat driver. Upper right: Eldridge. Lower left, Johnson. Lower right, Manz. 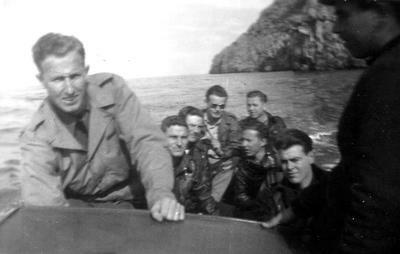 The air crews list has no known photos of the Sawyer crew. Although not the traditional, formal crew photo, I have some partial crew photos taken on leave at Capri. 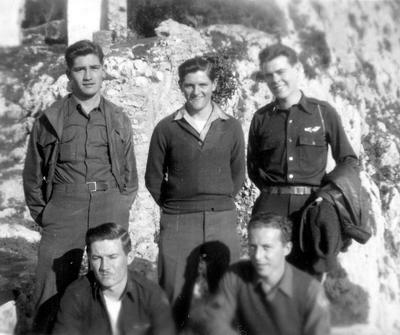 Bill Roberts' mission journal mentions a rest leave between missions on Jan. 15, 1945 and Feb. 1, 1945. 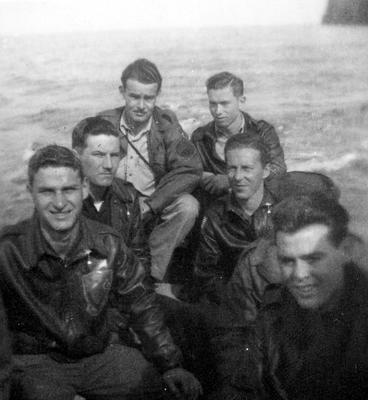 The asterisk indicates a crew member in one or more photo. I have another photo with your father in it. Jay, Sparks and Swede are sitting at a table in a bar, no date or location noted. Your Dad appears to have a paratroop shoulder patch on his uniform, but this is just a guess. My email is tr2manz@gmail.com and I can send you a scan of that photo. I don't know when you posted the pictures but I really appreciate it. My father is Sparks.